When configuring your Insteon Hub, you may encounter an alert informing you that the user name or password provided is incorrect. There are several reasons why this may occur. The user name or password was mistyped when entering the Hub credentials manually. The user name or password was changed from the default credentials printed on the bottom of the Hub (This should only happen if the Hub in question has been previously configured and should not be encountered with a new-out-of-the-box Hub). If you believe this to be the case, attempt a network reset to reset the Hub user name and password and attempt setup again. If you are not the original owner of your Insteon Hub, it would also be advisable to perform a factory reset. The QR Code containing the Hub user name and password does not match the credentials stored on the Hub. If you believe this to be the case, first attempt a network reset by following the instructions in this article. If you still encounter the user name or password alert, contact Insteon Support. 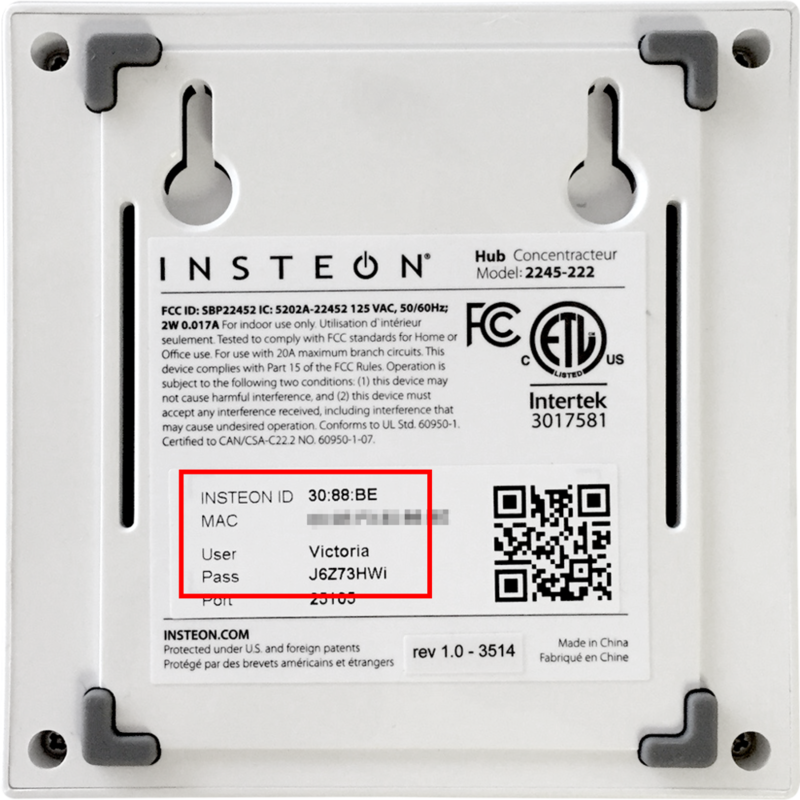 This Insteon Hub ships with a default user name and password which is automatically changed the first time it is added using the Insteon App. Password Insteon ID, all uppercase and without punctuation. For example "A1B2C3"
The user name and password for this Hub is stored in a label applied to the bottom of the Hub. The label contains both an app-readable QR Code as well as human-readable text that includes the Hub user name, password and Insteon ID. When entering the user name and password manually, type slowly to verify that no mistakes are made. When entering the Hub credentials manually, it is possible to misread some letters of the user name or password. Use the table below for potential alternate letters and numbers that may appear alike.